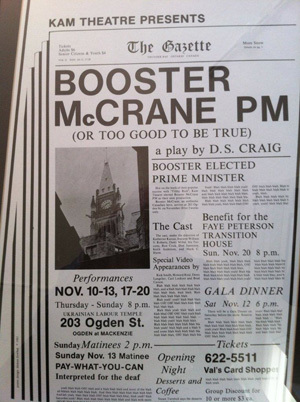 A comedy in the style of Mr Smith Goes to Washington, Booster McCrane, P.M. is the story of an inexperienced small town lawyer who is elected Prime Minister. He comes to Ottawa with Crystal Wildrose, his childhood sweetheart, and Chief Joe White Eagle his best friend and closest advisor. He discovers that the country is controlled and infiltrated by foreign interests. The only solution is war. THIS PLAY IS AVAILABLE FROM PLAYWRIGHTS GUILD OF CANADA.